Located just 150mts to Samara Beach, Near all services and attractions. Safe condo, close to beach and Town, GREAT VIEWS! Best Ocean View in Costa Rica! Hear and Watch the Surf and relax in the Infinity Pool. Relax at night while watching the fabulous Costa Rican SUNSET from the window. Hear and enjoy the sound of the birds and monkeys in the morning. Beautiful Condo, Sleep 7 people. -Just 150mts to Samara Beach, 3 minutes walking. -Near all services and attractions in Samara Beach. -All you need to get the best vacations in Costa Rica. Enjoy the sound of the surf and the amazing view from the infinity pool. Watch and listen as howler monkeys play before your eyes and parrots fly overhead. There are plenty of restaurants on and off the beach and are all great and offer an excellent variety but our personal favorites isare watching the sunset at Gusto's on the beach and stopping frequently into the bakery is a must! Keep your eyes on the lookout for Samara’s little buddies like the variety of lizards, iguanas and beautiful tropical birds. We love ocean views, and pura vida environment. Samara's the perfect beach to enjoy Costa Rica. So I should have listened to the comments but asked the owner Kerth if he had addressed the prior issues to which he replied that I should ignore the comments as that guest was annoyed about not getting an early check in. So the view is nice this is true but the apartment is very lacking. There was no coffee maker but rather just the pot which was full of rocks. Yep rocks! The oven was unplugged as if it did not work, The air was off when we arrived and it was incredibly hot. It did finally get to a cooler temperature after running the air continuously for 6 hours. The sheets did not fit the beds and kept coming off. Very annoyimg! There was no mattress protector. The pillows were quite possibly the worst pillows I have ever encountered. My husband is a general contractor and was shocked at the shoddy workmanship. The windows had no screens and would not even close properly. The window shades did little to keep the sun from heating up the apartment even with the air on. The showers were cold. The electric panel cover was half hanging off the wall. The dryer was not drying clothes. When we checked in cleaning towels had been left in the washing machine. The couch was not comfortable. The pool was locked at 8 o'clock at night. There is an ugly panel on.the wall advertising the time share. Obviously this is not someone's nice vacation rental but rather a money maker where the owner does not care about your comfort and whether you enjoyed your stay. Stay elsewhere. the property was difficult to locate in the dark when we arrived. although the directions were as stated about 800 meters outside of Samara, it wasnt quite that easy. There is a small hand painted white sign on the left side of the road we never saw in the dark. look up the hill to the left and you will see the condos. so you now need to just find the steep dirt road leading up to it. no one in town had heard of the Veneto Condos and so no one could help us. we tried calling the owner but both times the calls were declined. he eventually reached out to us via text but by then we had found in after about 30 mins of driving around. Although the unit looks like the photos, the property is quite run down as it looks like it's not properly being maintained. the room off the living room has a strong smell of mold so we ended up not using that room after night 1. There appeared to be no hot water on day 1, asked about it day 2 after all faucets seemed to not have any, response time was a few hours later. that night it was lukewarm at best. there were no screens on the windows like the other units have so we were unable to leave the windows open to listen to the ocean as all the bugs would come it. the bathroom faucets were loose and falling off the sinks, the kitchen sink cabinet had water damage, and doors were barely hanging on and inside of cabinet was covered in mold, water damage stains on the ceiling in the dining area, uncovered outlets holes in the rooms probably not safe for little kids. wi-fi was extremely slow with 3 users on basic apps. couldn't stream movies on netflix. pool has what looks like a jacuzzi, but staff told us its just a small pool for the kids, so dont expect hot water or jets. the kitchen was poorly stocked if you plan on preparing food. the knives were all dull, there was only 1 giant stock pot, and 1 giant electric skillet. although it did have a crockpot and deep fat fryer. it would also be helpful if it offered some basic staples like sugar, salt, pepper. This rental was the worst of our trip. One shower is unusable, the shower head is broken so water get out before reaching it. In the other shower(the usable one) the shower valve was so badly screwed each time you used it you would think it would fall apart. And toilet bowls are not fixed. Mattresses were the worst of the trip, and some make noise every time you move. Pillows are not better. Coffee maker spend one hour(i don't even exaggerate) to make two cups of coffee, and it put some sediment, you can visually see white points. There were tons of gnats, spider webs and one big cockroach. Wifi wasn't automatic neither. We had to find the modem, hide inside a closed shelf, otherwise it would be too easy. And cross fingers that the password hadn't been changed. Hopefully it didn't. Globally the cleaning is poorly done and its smell is really awkward, towels they offer you are wet. You'll notice some peeling paint too. It looks that someone bought this flat 15 years ago and never fix anything eversince. So you'll pay for the stunning view, the nice pool, a spacious flat and nice caretetakers but don't expect more about this rental ! Hello, thank you very much for your comments , This help us to offer better service every day. 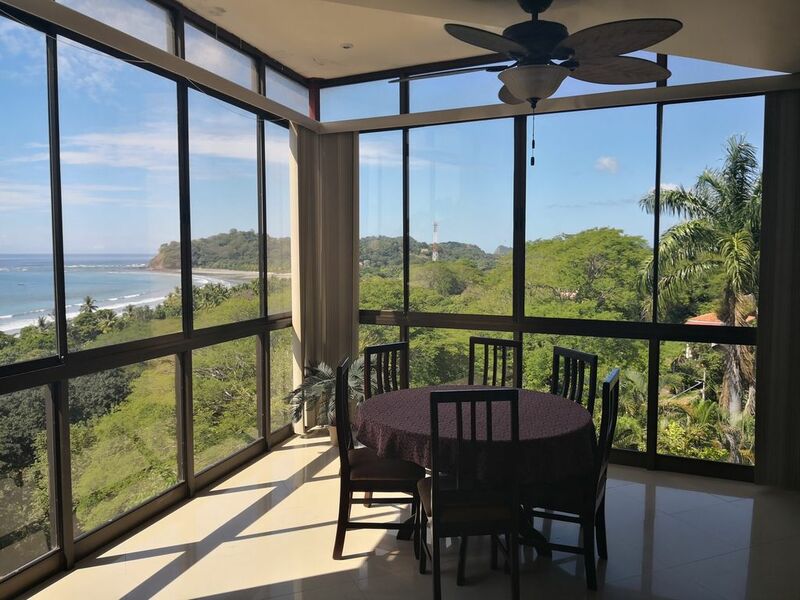 After more than 3 years of offering our condo with the best view of Carrillo and Samara beach, we received our first comment from a dissatisfied customer. With all the respect you deserve and after analyzing each point, we note that your disagreement is based mostly on our refusal to offer a refund of $ 200 for your two-night stay only because the internet service was a bit slow throughout the area during your stay (THROUGHOUT THE AREA, HOTELS, HOUSES, AND SHOPS THE INTERNET SERVICES WAS SLOW AND EVEN WE SENDED YOU THE NUMBER OF THE COMPANY TO VERIFY THE SITUATION). You checked in at 10 am and checked out at 3 pm, when our policies check in is at 2 pm and check out at 12 pm (SO WE DO NOT UNDERSTAND THE POINT IN WHICH YOU TELL US PROBLEMS ON ARRIVING, YOU ARRIVED BEFORE THE CHECK IN TIME AND WE WHERE AGREED. Our condo is located on the third floor in the center of the condominium so the windows are designed to offer the best experience during your stay, and after your complaint we checked every lock and all worked correctly, we also checked the logbook for security and maintenance of the condominium and we do not have a report which you have indicated that you had a problem closing them, There is Staff available 24 hours ready to solved any problem. This second floor condo was very spacious. It offered wonderful views of beach. We were able to see many different types of birds flying by and even monkeys climbing the trees below. Air conditioned rooms felt wonderful as Samara gets very hot, although you can also open the windows and enjoy the nice breezes and hear the waves. Very nice pool with great views as you are swimming. Has laundry right in condo. The building is guarded and we felt very safe. Very short walking distance to beach, restaurants, stores. The only disadvantage was there was no free Wi Fi and we needed to ask for bath towels. Owner did respond to emails, which was appreciated. Yes, I would stay here again and recommend it to others. We had a wonderful time here. PURA VIDA! Overall condo was great, had everything we needed. Beautiful views. Few minor improvements could be made but overall it was good. Location is close to town and beach, but Condo is at the top of a steep hill so it could be an issue if you do not have a car or are really out of shape! We rented this condo for 5 nights as a group of 6 adults + 1 Baby. The condo is a very short walk to the beach but located at the top of a steep hill (with plenty of stairs). Takes about 15 min walk to get into the heart of the little Samara town. No problem with keeping the place cool - all the A/C units worked great. The pool was a welcome amenity, especially for the baby! As advertised, the view was amazing. The condo groundskeeper/gateguard was very nice and the building & pool area is well maintained... however we found inside the actual condo unit is a bit lacking. Could use some more TLC, especially in the bathrooms and in the kitchen -- there are things that are missing/needing replacing. Also note there is no wi-fi available in the condo but you are able to connect at most of the restaurants/cafes in Samara. We learned to surf at C&C surf school and loved it! The instructors were great, and it was awesome to be able to take boards out whenever we wanted for the duration of our stay. Lots of lovely places to eat in Samara - great vibes in this little town. Most places only take cash, so be prepared with plenty! Our condo is located in Veneto Condominium, with 24/7 hours security. Just 150mts to Samara Beach, 5 minutes walking to Samara Main Street. Book now, and get the best price in Samara Beach. Near all services and attractions - Security - Clean and Comfortable. PURA VIDA !!!! !